The new Tacoma is a good truck, it’s not a great truck. Toyota has the money and resources to make a mid-size pickup that would knock it out of the park. But despite serious competition from GM, Toyota bunted on this pitch. The took the base hit because they didn’t have to swing any harder. That is because most Toyota truck buyers aren’t shopping in GM showrooms. Just like Toyota isn’t worried that the new Malibu is going to steal an Camry buyers. People buy Camrys, and continue to buy them, because they want a mid size sedan that they don’t have to worry about. 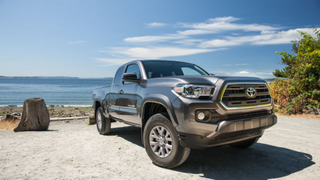 Tacoma buyers, for the most part, want the Toyota because they perceive it will be the more reliable truck in the long run compared to the GM offerings. The Colorado/Canyon may hold up very well after many years of use, but the Tacoma has had that longevity legacy for awhile. Almost everyone knows someone with an old Taco with 300,000 miles on the clock and it’s still running strong. More reviews will come out, and truck fans will take to the internet complaining how the 2016 Tacoma’s interior should be nicer or the gas mileage should be better. Yet anyone who is actually in the market for one will eventually stroll on in to their local Toyota store and drive home with a new Tacoma. The sad part about all this is there was probably quite a few very talented and enthusiastic Tacoma engineers with big plans on how to make the 2016 model the best ever. There was probably some super awesome trail running version with monster tires, crazy suspension travel and all the auxiliary lights you can dream of. That is what loyalty buys you.